The weekly EIA working gas in storage report showed a 71 Bcf net withdrawal, bringing the current storage level to 1.645 Tcf. The weekly withdrawal was 37% lower than the same week last year (-112 Bcf) and 34% lower than the five year average (-107 Bcf). 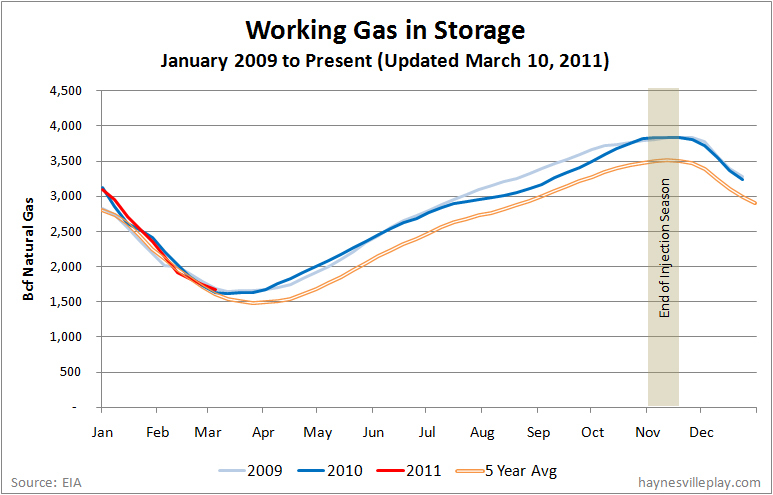 The current storage level is 32 Bcf higher than last year and 21 Bcf higher than the five year average. Temperatures for the week averaged 40.0 degrees, which is about average and on par with last year's weather. But there was significant variation, with warmer temperatures across the south and southeast and cooler temps in the upper midwest and west.